Update: Nougat added to software section! All signs point towards change at LG. After years of unique designs and smaller experiments, like the LG G4’s curved display, the South Korean company has now manufactured a modular smartphone. Whether this concept can convince you to buy one, you’ll discover in this LG G5 review. This year, LG was in a hurry. The G5 was presented one day before that of the flagship smartphones from rival Samsung at Mobile World Congress 2016. But while Samsung began shipping the Galaxy S7 and S7 Edge just two weeks after the presentation, on March 11, LG fans had to wait until the beginning of April. The prices of these smartphones hardly differ. Just like the Galaxy S7, LG is selling the 32 GB version of the G5 for around $699. Customers who got in early and bought the G5 by April 16 were given a free CAM Plus module worth $70. Samsung offered a similar pre-order bundle to buyers of the S7 and S7 Edge, with the $99 Gear VR thrown in for free. For years, LG advocated polycarbonate as the material of choice for its smartphone casing. The reason for this? It was the only way to ensure that the battery remained changeable. Not until the end of 2015 did LG produce a phone with a different material. With the V10, LG dared to use metal for the smartphone’s frame. With the G5, LG is one of the last manufacturers to build a flagship smartphone with a full metal body. But there are different ways of production. The first and most common way is the milling. Here, the housing is milled from a block of metal. HTC has used this technique since the One M7, Apple has since the iPhone 5 and Huawei did with the Ascend Mate 7. The LG G5 aluminum body has been constructed differently to other devices with a similar build. Rather than being milled out of a block, it has been done with an aluminum casting process. This method was developed in cooperation with the Korean Institute of Technology and is mainly used in the automotive and aerospace industries. This method caused some confusion among YouTubers and bloggers, as LG covered metal body with a primer and paint layer. Most full-metal smartphones are given color accents via anodizing, rather than painting. This layer caused some G5 reviewers to question whether the G5 should even be called an all-metal smartphone, seeing as the hand does not touch metal. But the fact is that the LG G5 has a housing made of aluminum, but just under a layer of primer and paint. There are more changes in the design of the G5 compared to the previous models, the G4 and G3. While the on-off button is still located on the back, the volume buttons are now on the left side. In addition, LG has placed a fingerprint sensor inside the on-off button as it did with the LG V10. If a fingerprint can unlock the G5, then pressing the on-off switch is not necessary. This button is therefore only really necessary for a restart, or just to switch the display off. 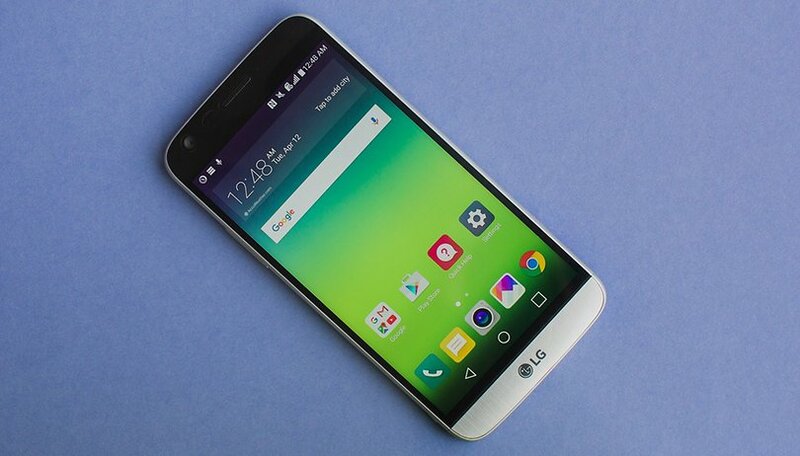 On the back of the LG G5 you’ll find double-camera optics placed alongside an LED flash and laser autofocus system. Both the complete camera system and the fingerprint sensor are not recessed into the housing and so create a hump. Nothing we haven’t seen before. On the top of the frame is a noise canceling microphone and headphone port. There is also an infrared transmitter. The LG G5 is one of the last flagships with an infrared transmitter, with it being an omission from the Galaxy S7, S7 Edge and HTC 10. If you absolutely must have one to operate a TV or Hi-Fi system, you should consider buying the G5. Onto the housing. In our test unit we noticed minor design weaknesses. First, a sharp-edge was present between the frame and the battery module release button, as well as a gap between module and smartphone due to poor alignment. After speaking with LG, we discovered that these peculiarities were only part of an early batch of G5 units. Units made during final production do not have these flaws. With the LG G5, the South Korean manufacturer’s product developers decided to reduce the display size. Thus, the G5 display is only 5.3 inches and is situated exactly between the size of the Galaxy S7 and S7 Edge. Regarding resolution and display technology, LG remains faithful to the G4. It has the same resolution of 2,560 x 1,440 pixels, with a slightly reduced size of 0.2-inches diagonally, making the pixel density now 554 ppi instead 534 ppi. Only in a direct comparison of the two generations of LG flagships shows that the graphical qualities of the G5 are more refined. In the field, the LG G5 is absolutely at the level of Samsung Galaxy S7 or S7 Edge. While the Super AMOLED display of Samsung smartphones has vibrant colors and deep blacks, the G5 leans more towards more natural pastel colors. A function that we’ve seen in both Samsung and LG’s premium phones is always-on display. But due to the panel setup, LG had to apply a trick. Since the pixels of an IPS panel do not illuminate individually, the upper-third of the G5’s display must be illuminated for always-on display to work. This lighting is reduced to a minimum and can not be adjusted. Too bad because, in direct sunlight, always-on display is not visible. In addition, this need for permanent backlight affects battery life. Overnight, the battery charge indicator fell 10 percent after seven hours of sleep. This is just under 1.5 percent an hour. Fortunately, there is the possibility to disable always-on in the settings. I don’t personally find any significant benefit in using this feature. If I want to see the time, then I can just turn on the screen and look. The special feature of LG G5 is clearly modular expandability. The modules, also called ‘Friends’, can be attached to the G5 via a plug inside the smartphone. Here, the unit must be disconnected from the phone to change modules. For safety against accidental removal of a module, a backup button must be pressed on the bottom-left of the phone. Currently there are only two optional modules for the LG G5: the CAM Plus camera, with an integrated 1,200 mAh battery, and a B&O Hi-Fi module. This module, with an integrated 32-bit DAC, will greatly improve the sound experience of using the LG G5 with corresponding headphones. But for that you need audio transmitted at 384 kHz. To use the modules, the battery needs to be changed. For this purpose, it is necessary to turn off the G5, as there is no back-up battery which keeps the phone on while modules are being changed. LG probably thought that G5 owners wouldn’t spontaneously change modules anyway. Besides these two modules, there is a 360-degree camera which can shoot video or photos. A detailed review of these modules is on the way. For its software, the LG G5 runs Android 6.0.1 with the security patch level from March 2016. LG has made its own UI yet again. What might be a little confusing for some is that there is no App Drawer. But do not panic; this can be reintegrated with the LG Home Launcher 4.0 found in LG Smart World. Interestingly enough, Samsung, with the Galaxy S7 and S7 Edge, also has the option for customers to use a TouchWiz UI App Drawer. This version is not running from the factory and must be activated in the settings. Update, August 18, 2016: LG is releasing an Android 7.0 beta for LG G5 owners living in South Korea. Even though it's not part of the official Android beta program, this will instead be LG-built and skinned firmware. While owners in other countries can't become beta testers themselves, it's a sign that the LG G5 will be receiving Nougat within the very near future. We'll update you when we hear more. But otherwise the UI of LG has become much tidier and slimmer. Factory activation of Smart Bulletin has been disabled, who was still in previous LG smartphones and UI versions. It’s just a pity that LG has dropped multi-window view. The reason: Android N will natively support this function. Other than that LG has reduced bloatware and the functions described above, there are no major changes to the UI. Still, you can pre-sort the settings into four categories or set a list view. The appearance was refined here and I like the fine black writing on a white background in the settings. Of course, LG and Sony also introduced knock-on, allowing their smartphones to be unlocked via a double-tap. Overall, the UI is tidy and balanced. Even the lost App Drawer is not bad because it can be installed in the form of the LG Home Launcher 4.0. That this can only be ordered from LG's own Smart World app store, which I find strange. Two app stores could be a bit confusing. Last year, LG was constrained with its decision to use Qualcomm’s top processor, the Snapdragon 810, due to its thermal issues. In fact, with the G Flex 2, LG was the first to market with this processor. The hexa-core processor was then also used in the G4. With the G5, everything is different. Qualcomm has completely redesigned the Snapdragon, meaning the 820 has four cores able to achieve high performance levels. In our benchmarks, the G5 with the Snapdragon 820, 4 GB of RAM and the Adreno 530 graphics chip, had to beat the Galaxy S7. Samsung's best smartphone is in our internal ranking one of the fastest smartphones. It is yet undefeated. In the sum of the individual benchmarks, the G5 was not able to beat Samsung's Galaxy S7. The reason is the potent graphics unit of the Galaxy S7. The working twelve-core Mali-T880 MP12 - not to be confused with the tetranuclear Mali-T880 MP4 from Huawei P9 - is decisive for a point victory for the Galaxy S7. Overall, the G5 comes to 98.50 percent of the S7 in our performance index. The LG G5 uses a total of three cameras, two of which are located on the back. By a particularly wide angle of 135 degrees, scenes can be a little more broad than those captured with other smartphone cameras. The two cameras on the back feature 16 MP or 8 MP sensors and, unfortunately, the wide-angle camera has the lower-resolution sensor. The 16 MP camera is the same model used in the G4. The selfie cam on the front also has a resolution of 8 MP. Thanks to the two cameras and the numerous new modes in the camera app, interesting collages can be made in a blink. In popout mode, the LG G5 makes a single image with the rear cameras. The image section of the 16 MP camera is placed within the 8 MP image of the wide-angle camera. The latter can be optically remodel with filters. In the second creative mode, called Multiview, all three cameras are combined to form a collage. The breakdown of the camera images can be adjusted using predefined masks. Unfortunately, the wide-angle optics also have a small handling drawback. Again and again you have to rearrange your shot because your fingers will often appear in the frame. But after a while, the G5-owner will get the hang of how to hold the G5 while shooting with the wide-angle camera. If you don’t trust automatic mode and would rather adjust exposure, ISO, shutter speed and white balance yourself, you’ve got a manual mode option. In addition, there is also the ability to record images in RAW or JPEG and RAM at the same time. Those who want to record videos in this mode can use this app too. We have however noticed slight frame drops. Regarding picture quality, the LG G5 shines from two sides. The 16 MP main camera takes pictures in standard G4 image quality. The 8 MP camera is at first sight quite good. But zoom in and you’ll quickly realize that there’s a lack of image sharpness. LG G5 battery power is a weak spot, since other 2016 flagships use bigger units. The Galaxy S7, Huawei P9 and HTC 10 all use a battery with 3000 mAh, while the LG G5 has "only" a 2,800 mAh battery. In AnTuTu Battery Tester, the LG G5 is therefore - no surprise - behind the Samsung Galaxy S7. With every hour of calls, watching videos and surfing the internet via Wi-Fi, I came at the end of a day with a remaining capacity of nearly 25 percent. But this, I have to say, might have had something to do with always-on. Had I disabled it, after a 12-hour day about 35 percent battery capacity would have remained. Also let's not forget that the LG G5 has a removable battery. While its competitors do not have removable batteries, G5 owners can just switch to a spare. I personally would like to see if modular design takes off. Better yet, if the compatibility would be maintained for other upcoming smartphones from LG, so that lenses could be used with different bodies. If it did, a little dream would come true. My LG G5 would not turn on a few days after purchase. Purchase was made outright. When getting the phone back from LG warranty (some 6 weeks after purchase), the sim card tray was gone..... I called LG and they transferred me to Best Buy where I purchased the phone. I cannot get any help from the store where I purchased or through LG directly. Do yourself a favor and don't buy this phone. LG are not a company that deserves loyalty or your hard earned cash. the only thing is the camera desing. why is the camer so awfull outstanding. I currently have the g3, had the g2 before. I would rather get a g4 over the g5. I think making the battery smaller is a major turn off. And modules are cool but taking my phone apart, no thanks. I'll be skipping the g5. The lg v10 will be the best option from lg imo. I like the look of lg g5.Customer have to decide that the product is beautiful or not,not you. I think LG has done a great job trying to give all the features that people want in a phone. I really wish reviewers would take their premium materials and stick them up their a$$es. I will take a plastic back phone with the features and durability I want over and all glass or metal that don't. The G5 will not be released here for another week. I will buy one when they are available. I am in love with almost everything. I ordered mine from Costco and received it last Friday. When you buy from Costco you always get an extra accessory that varies based on the handset you buy. With the G5 I received a portable battery charger; plus I've submitted my info to receive an extra battery, usb-c cord, and charging cradle from LG. . . I dont expect to ever have battery issues!! I dont miss the app drawer. I made folders for the different types of apps (gaming, medical, banking, etc) and have nice clean home screens that are organized and allow me to have all of my apps at my fingertips. The folders are a HUGE improvement over the app drawer. My one complaint is having the up/down buttons on the side. I loved the back buttons. Really loved them. But I understood why they were moved the moment I used the camera and figured out that they serve as a shutter release! No more trying to take a shot and not being able to find the on-screen shutter release. A physical button makes so much sense! So even without the camera "friend" you have a physical button. Way to go LG. Really like this phone and it's definitely one of the top releases so far. I like the design- the front looks a lot like BlackBerry Z30. Too bad they didn't continue with improving the hardware of Z30 with further releases. I guess the BB OS was to blame as people started turning away. I left my SGS4 for a LG G4 and I do not intend to go back to $ammy. Too expensive. I liked the buttons on the back because I am left handed. Guess I'll be sticking with my G4. cool phone, i have the ugly S5, and i carry a 16,000 mAh battery pack with it. i will carry a 16,000 mAh battery pack with any phone they make. no battery issues here. i was looking at the s7, not the edge. But this phone looks pretty interesting too. i have to check , touch, handle them too see which one will suit me.i think the Samsung S line is over rated. the only thing hi end is the price. There are some great alternatives out there. Why carry a brick when you have a phone with a removable battery? Get two batteries and an external charger It will be lighter and more functional.